WHO will be the Inter –Party Cooperation (IPC) presidential candidate? Nobody can tell.But Makerere University researcher and political science lecturer Prof. Aaron Mukwaya has confidently predicted that the opposition alliance will eventually collapse without achieving its objective. IPC’s objective is to field a joint presidential candidate to deny President Yoweri Museveni victory in the 2011 election. Nominations for the joint candidate are scheduled for Tuesday at Kololo Independence Ground. Speaking to Sunday Vision, Mukwaya formulated various scenarios all pointing to the failure and collapse of the loose coalition composed of Forum for Democratic Change (FDC), Uganda People’s Congress (UPC), Conservative Party (CP), Justice Forum (JEEMA) and the Social Democratic Party (SDP). “I doubt whether all those in IPC agree on the question of Mengo, the question of land, the question of the federal model, as well as the baggage and luggage of Uganda’s history. Even their ideologies are different. I, therefore, don’t see any possibility of their marriage standing the test of time,” Mukwaya argued. Former JEEMA chairman Mohammed Kibirige Mayanja told Sunday Vision that he concurred with the university don. “In IPC we have various political parties with differing interests and aspirations and different ideologies yet each of these parties want to capture power. This makes the process of weaving an alliance and electing a joint presidential candidate difficult,” Mayanja admitted. “Some people thought the race was between UPC and FDC, but even JEEMA is determined to take the presidency and that is why I stepped down for Hussein Kyanjo. We shall have to whether the storm and go through it.” Mukwaya explained that the parties came together before widening their influence on the ground which he said was a waste of time. “There is no scientific evidence that since 2006 those parties in IPC had been gaining ground from the yellow areas. They seem to be struggling for areas within their own territories and this will compel them to fight each other instead of fighting NRM,” Mukwaya elaborates. Yellow is the NRM colour. The renowned academician reasoned that IPC is abstract not only to the voters but also to the parties involved. “The conceptualisation of IPC is even very distant from these parties involved because the donors are the ones who have provided the framework as well as the content of IPC. It is neither a vehicle for political mobilisation nor one for winning state power. What keeps these parties together in IPC is nothing other than the fact that it is income-generating project in which donors have injected a lot of money,” he stated. Mukwaya advised the opposition parties to abandon IPC activities so that each party concentrates its efforts and resources on widening its hold on the ground. “My great peace of advice to these opposition parties in IPC is to realise the need to disengage and go back to their individual camps. There is no way they will sell the amorphous IPC during the 2011 elections,” he counselled. “Let them ask the donors to give them money for strengthening their parties. They are just wasting the little time they have left organising IPC instead of organising their own political parties whose current state leaves a lot to be desired.” On whether if the IPC won the power, the five parties would work together, he said, “Even that is impossible. For instance, if the FDC president became the IPC presidential candidate, the Electoral Commission will put him on the ballot papers as an FDC candidate with the FDC symbols. So power in that case will be handed over to FDC and the other parties will be at the mercy of FDC,” he explained. “The parties FDC is allying with are inconsequential. Even UPC, it is a party with a strong past but with a weak present that takes it out of the political power equation.” “FDC is wasting its little time with frozen parties which don’t have significant support. By hiding under IPC, FDC is hiding under a dead lion,” Mukwaya argued. A top FDC who preferred anonymity revealed that they are afraid that if the UPC president became the presidential candidate, the opposition coalition would be denied a significant number of votes in the Buganda, a region that could decide who wins the 2011 elections. “The name UPC in Buganda sounds like hell or a bad omen. That is why even when all the IPC parties agreed to support and campaign for DP’s Betty Nambooze in the Mukono North by-elections UPC president Olara Otunnu was discouraged from openly supporting her because his party is loathed in the central region. As FDC and UPC are embroiled in scheming and counter-scheming to provide the IPC joint presidential candidate the process of electing one has been further complicated by JEEMA’s presidential flag bearer Kyanjo jumping into the race. “I am a better option to FDC’s Besigye and UPC’s Otunnu. First of all these two continue looking at each other as more deserving but one also thinks of himself more deserving than the other. Having both of them in the equation may not solve the problem quickly,” Kyanjo told Sunday Vision. The Makindye West legislator further argued that he enjoyed overwhelming support from his home base region of Buganda region, a quality which his colleagues lack. “The people in the central region look at IPC with suspicion because of the absence of their own. If their expressed desire is translated into practical support, the whole story would end with Kyanjo getting the IPC joint candidature,” he argued. 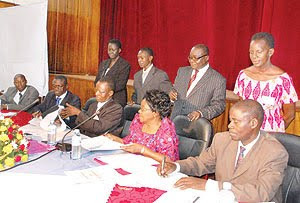 During JEEMA delegates conference recently, Kyanjo assured party members that he would emerge as the most powerful opposition presidential candidate in the 2011 elections. “There has been mixed feelings about IPC. JEEMA will not be swallowed. We are the best party to produce the IPC presidential candidate. We have a clean image. JEEMA has nothing to apologisze for like FDC and UPC, “Omar Kalunge Nyago, JEEMA spokesman argued. In interacting with strategists of the three parties, Sunday Vision discovered that each party believed their candidate should be the joint presidential candidate. This makes it hard for FDC, UPC, and JEEMA to agree on a joint presidential candidate.